This year’s Strata Data Conference in San Francisco is coming up fast, and if you’re one of multiple companies exhibiting or speaking, or an engineer or data scientist sharpening your skills, or simply attending to soak it all in and network with your peers and competitors, here are a few thoughts on making the most of the investment. It sounds obvious, but this remains in the “you’d be surprised” category. Whether you’re a technology vendor or an individual attendee, be clear about what you expect or need to get from attending Strata (and any other event for that matter). If you’re the head of marketing or in sales, your goals and the ROI sought inevitably will be different from a data scientist taking a class in machine learning and TensorFlow. In any case, you’ll also need to think about how you will know or measure success. This applies before, during, and after the event. If you’re an old hand at working events you should have this down pat, but there are always new tweaks and new channels to take advantage of, and it’s still not too late for most of these. Long before an event takes place you should be thinking about how you align with the conference theme and how to best position your company for success. “Make Data Work” and the “Epicenter of data and business transformation” are plenty broad, leaving you to assemble the assets and partners necessary to give yourself the best shot at making a splash at Strata and afterward. 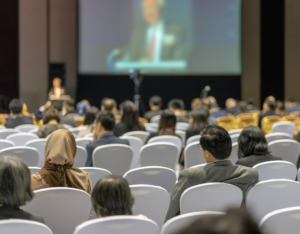 Submitting for a speaking slot is an obvious step prior to any event – of course spots at major industry conferences are highly competitive and the time to submit for this Strata event is long past, but make sure you don’t doom future pitches by being overly promotional and make sure you submit as close to when submissions open up as possible. Start socializing your attendance and using the event hashtag (#stratadata) well before, as well as during and post-event. In addition to Twitter and LinkedIn, consider highly visual channels such as Instagram and YouTube. And for those still questioning the ROI on social media, event content including images remains one of the most successful forms of social content for attracting new followers and increasing engagement. Attendees and non-attendees, major brands as well as start-ups, customers and potential customers will be searching and following the event and you want to be found and be part of the conversation. To that end prepare yourself a cheat sheet of top handles you want on hand to include in tweets and posts – @strataconf, @bigdata, @OReillyMedia, not to mention key media and analysts you’d like to build relationships with. Sign up for and use the online attendee networking channel for early outreach to other registered attendees. Start conversations and connections early and cement them at the event in-person. Use it – these things work! If not already underway, start outreach to attending media and analysts as well as those who cover big data, AI, data science, analytics, etc. Again competition for attention is intense and reporters book up early. Your pitch or story has to be compelling and ideally data-based to even be considered. Distribute a “newsworthy” press release – not about the fact you are attending, but why your target audience should be interested. Post an educational or insightful blog pre, during or immediately post event. This is not a reportage of the fact you attended, but a thoughtful prediction, commentary or reflection that could only come from YOU based on your industry experience and customer-focused perspective. Authenticity is a winner. As a CMO or VP of Marketing your goals will no doubt span the brand awareness-lead generation spectrum. In an integrated marketing approach, the impacts are spread across multiple programs and disciplines, beyond any single event. Besides metrics such as number of attendees at a keynote, booth traffic, number of MQLs from the event, amount of media coverage, number of new followers on social media, you’ll also want to look at the impact of media and analyst relations on lead generation or conversions, and the same for owned social media and content marketing. We’d love to hear from you what metrics you care about and that you find most helpful in determining the value of public relations for your company.